Before the 2016 election I feared that a Clinton presidency would turn Democrats into a pack of neocon warmongers and we would see attempts to limit free speech in protest. What I didn’t anticipate was that her loss would do the same thing. Democrats are spreading hysteria about Russia which is comparable to the misinformation spread about Iraq in the run up to that war. Many Democrats are spreading claims which are not supported by either the Congressional investigations or the information in Robert Mueller’s indictments. Many are adopting McCarthyist tactics to attack those who attempt to question their misinformation, failing to understand that debunking false claims about Russia no more makes one pro-Putin than debunking false claims about Iraq and WMD made one pro-Saddam. Fortunately there are still some sane voices in the world. Today I will look at responses to the Russian assassinations in London and to the reports of Russian infiltration of the power grid. For the sake of discussion I am assuming that the accusations made regarding these two events are true, but we must keep in mind that repeatedly there have been examples of accusations being made, the claims later being retracted, yet many people continued to spread the false claims. This includes the retracted claims of agreement by seventeen intelligence agencies agreeing when in reality all that existed was a fact-free assessment by a small number of anti-Russian individuals in the intelligence community. NBC has repeatedly raised the debunked claims of Russian hacking of our voting systems. Previous claims that the Russians infiltrated the electrical grid in Vermont were later retracted. Many Democrats act as if collusion between Trump and Russia has been established, and that Russia altered the election results, when there is no evidence of either, and no charges that this was done in any of Robert Mueller’s indictments to date. As I said in parliament, the Russian authorities must be held to account on the basis of the evidence, and our response must be both decisive and proportionate. But let us not manufacture a division over Russia where none exists. Labour is of course no supporter of the Putin regime, its conservative authoritarianism, abuse of human rights or political and economic corruption. And we pay tribute to Russia’s many campaigners for social justice and human rights, including for LGBT rights. There can and should be the basis for a common political response to this crime. But in my years in parliament I have seen clear thinking in an international crisis overwhelmed by emotion and hasty judgments too many times. 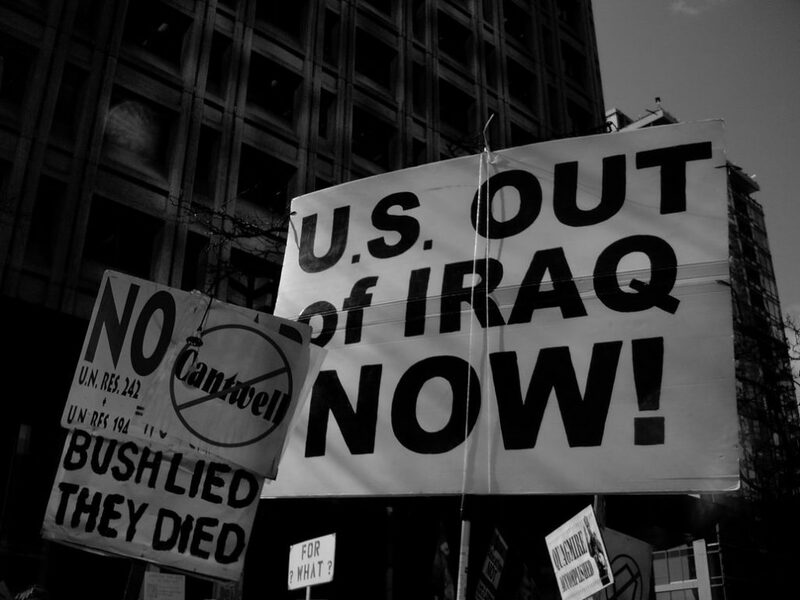 Flawed intelligence and dodgy dossiers led to the calamity of the Iraq invasion. There was overwhelming bipartisan support for attacking Libya, but it proved to be wrong. A universal repugnance at the 9/11 attacks led to a war on Afghanistan that continues to this day, while terrorism has spread across the globe. The continuing fallout from the collapse of the Soviet Union and the virtual collapse of the Russian state in the 1990s must be addressed through international law and diplomacy if we are to reverse the drift to conflict. 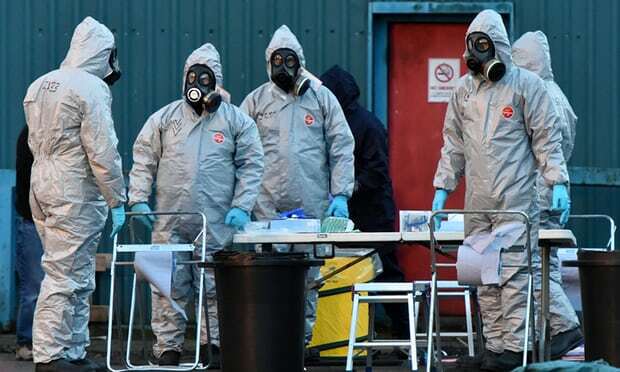 Right now, the perpetrators of the Salisbury attack must be identified and held to account. Only through firm multilateral action can we ensure such a shocking crime never happens again. The natural question that emerges is: How serious is this hacking? The idea of Russian hackers having access to the control switches of America’s power infrastructure is particularly unnerving, raising the idea of waking up one morning to learn that the United States has simply been switched off. Several experts who spoke with The Washington Post, though, explained that this is not only oversimplistic but also that it is almost certainly impossible. The effects of infiltration of America’s power grid would be much more geographically limited thanks to the distributed, redundant nature of the system. In fact, it’s more than a little like another alert issued by the government about Russian infiltration efforts: the one on Oct. 7, 2016, warning about Russian efforts to tamper with state voting systems. That announcement came from the director of national intelligence and the Department of Homeland Security and indicated that Russian hackers were “scanning and probing” election-related systems. The message, one of the few public responses to Russian interference from the Obama administration, didn’t get as much play as it might have, given that it came out the same day as The Post published the “Access Hollywood” tape. It’s a serious situation, warranting the sort of dramatic response we saw from the government on Thursday. But do not expect to wake up some day soon and learn that Russian President Vladimir Putin now controls the flow of electricity to your house. Real life, as always, is less dramatic than the movies. Bump has a lot more detail in his full article, including the belief that Russian hackers gained access through spear-phishing. While there is controversy over whether the DNC’s email was released to Wikileaks due to hacking or a leak from the inside, the possibility has also been raised that access to the DNC’s email was through spear-phishing. We would be much safer if the media and politicians spent half the time they spend on misleading stories about Russia to better educate the public about how to respond to such attempts to gain access to our computer systems. The United States has been at war in the Middle East since the invasion of Iraq in 2003, but has only been partially successful with regime change in Iraq, and far less successful in reducing terrorism. The United States has become the aggressor nation, with its actions only result in increasing anti-American sentiment and creating more “terrorists.” The “war on terror” started as a Republican mistake based upon lies under George W. Bush. Both major political parties now own this failure, with the Democrats nominating an ultra-hawkish candidate for president in 2016. Hillary Clinton was not only one of the strongest proponents of the war in Iraq, making false claims of cooperation between Saddam and al Qaeda, but also was the major architect of the failed attempt at regime change in Libya, which was also based upon false claims. She also has pushed for greater intervention in Syria, including imposing a no-fly zone, which would have resulted in greater casualties, required U.S. troops on the ground to support, and would have put the United States into direct conflict with Russia. 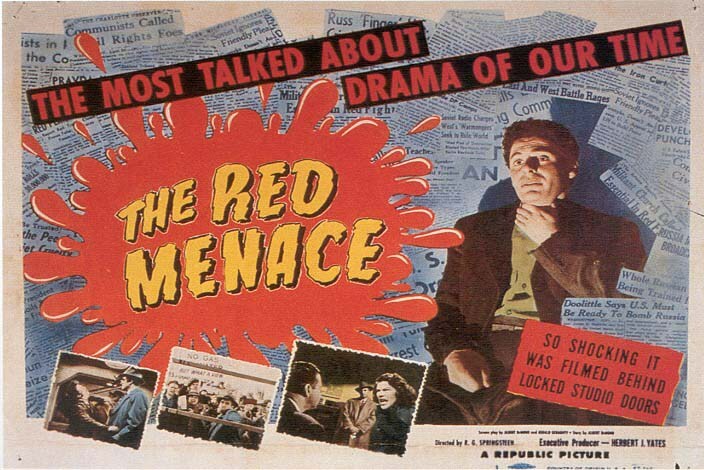 The revival of Cold War style anti-Russia hysteria and McCarthyism by establishment Democrats is also of great concern. The Republican candidate, while less interested in interventionism, has been utterly incoherent on foreign policy. It is quite clear that Donald Trump’s claims of a secret plan to defeat ISIS were as imaginary as Richard Nixon’s secret plan to end the war in Vietnam. His only plan is more of the same type of counterproductive military attacks. At this point there are only signs of continued expansion of the warfare/surveillance state with no end in sight. With both major political parties now becoming advocates of neoconservative interventionism, only third parties such as the Libertarian Party and the Green Party had a rational foreign policy position in 2016 opposing continued interventionism. In late June, the libertarian Cato Institute issued a policy paper entitled Step Back: Lessons for U.S. Foreign Policy from the Failed War on Terror. The full paper, along with an audio version, are available here. In the wake of the terrorist attacks of September 11, 2001, the United States launched an international war on terrorism defined by military intervention, nation building, and efforts to reshape the politics of the Middle East. As of 2017, however, it has become clear that the American strategy has destabilized the Middle East while doing little to protect the United States from terrorism. After 15 years of considerable strategic consistency during the presidencies of George Bush and Barack Obama, Donald Trump now takes the reins having promised to “bomb the sh—” out of ISIS and “defeat them fast.” At the same time, however, Trump broke sharply in his campaign rhetoric from Republican orthodoxy on Iraq and Afghanistan. Whatever President Trump decides to do, an evaluation of the War on Terror should inform his policies. We argue that the War on Terror failed. This failure has two fundamental—and related—sources. The first is the inflated assessment of the terror threat facing the United States, which led to an expansive counterterrorism campaign that did not protect Americans from terrorist attacks. The second source of failure is the adoption of an aggressive strategy of military intervention. The lessons from the War on Terror indicate that it is time for the United States to take a different approach. Policymakers need to acknowledge that although terrorism is a serious concern, it represents only a modest security threat to the American homeland. Further, the United States should abandon the use of military intervention and nation building in the War on Terror. Instead, the United States should push regional partners to confront terrorist groups abroad, while the U.S. returns to an emphasis on the intelligence and law enforcement paradigm for combating the threat against the American homeland. Obviously, the United States is not now a police state. But given the extent of this invasion of people’s privacy, we do have the full electronic and legislative infrastructure of such a state. If, for instance, there was now a war that led to a large-scale anti-war movement – like the one we had against the war in Vietnam – or, more likely, if we suffered one more attack on the scale of 9/11, I fear for our democracy. These powers are extremely dangerous. Tech and civil liberties advocates are imploring the Obama administration to rein in the government’s massive surveillance apparatus before President-elect Donald Trump takes office, fearful he will carry out his campaign promises to register Muslims, spy on mosques and punish companies that offer Americans unbreakable encryption. But many national security experts and former administration officials say the effort is almost certainly doomed to fail. “I don’t know how you tie the king’s hands in just the weeks going out,” said Michael McFaul, a former ambassador to Russia under President Barack Obama. And some civil libertarians blame Democrats for being too content to allow President Barack Obama to wield the sweeping, post-Sept. 11 surveillance powers he inherited from George W. Bush, rather than rolling them back so that no future president could use them. “We shouldn’t be relying on the benevolence of the leaders put in power after an election to ensure that people’s privacy and civil liberties are protected,” said Neema Singh Guliani, a legislative counsel with the American Civil Liberties Union. …Hoping to head Trump off, civil liberties, digital rights and watchdog groups are pleading with Obama to take a series of actions to weaken the surveillance state. Those include releasing classified inspector general reports and the secret legal rationales behind the government’s spying efforts, which could help advocates challenge Trump in court. Some also urged Obama’s team to purge the NSA’s databases of some of the information they hoover up, wiping out reams of data that are focused on foreigners but incidentally drag in details on an unknown number of Americans. …Obama came into office vowing to “revisit” many of these powers, but privacy advocates believe he has largely failed to do so. While the president has regularly spoken about the need for greater checks and public oversight of the system, he has defended the powers themselves. “This may go down in history as President Obama’s most consequential mistake,” Timm said. Civil libertarians have been concerned about the danger of abuses under Donald Trump, but the degree of government surveillance placed civil liberties at risk regardless of whether Trump was elected. Other than for Trump’s xenophobia, Hillary Clinton’s views on civil liberties and the surveillance state are not all that different from those of Donald Trump. There is one benefit to Trump as opposed to Clinton winning–Democrats will be far more likely to protest abuses under Trump than they would protest abuses from Clinton. Many partisan Democrats have been whitewashing her record and excusing her extremely conservative views on First Amendment rights. Those of us who protested the growth of the surveillance state under both Bush and Obama were often ignored by Democrats when Obama was president and they thought he would be succeeded by Clinton. 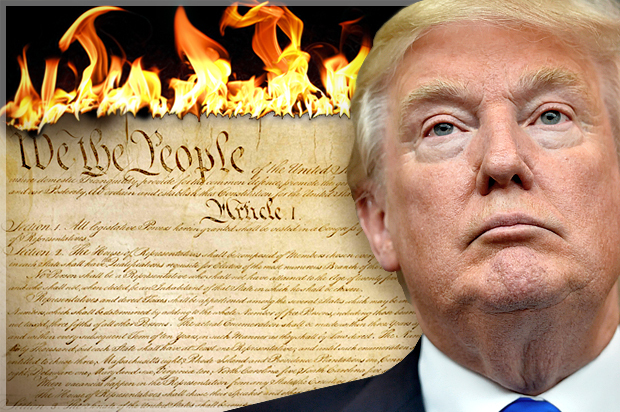 The election of Donald Trump is opening more eyes to the danger of such powers in the hands of the president. If you were the government and wanted to maintain a state of perpetual war, how would you go about it? First, you’d need an enemy, of course, but that part would be pretty straightforward. After all, if the US government could convince the citizenry that Iraq was the 9/11 enemy but that Saudi Arabia was our friend when nineteen out of the twenty 9/11 hijackers were Saudi, it’s fair to say that just about anything is possible. But the next part would be harder. On the one hand, you’d have to claim progress in the war so that the citizenry would maintain its support for the war. On the other hand, you couldn’t actually defeat the enemy, lest the war end. Eisler here was referring to the latest in a long string of news reports on a significant victory, such as killing a key member of ISIS, while nothing actually changes. Maybe it’s a coincidence that according to the Pentagon, we’ve achieved yet another concrete War on Terror victory, while according to American officials and counterterrorism specialists, outright victory is still intangible and elusive. Maybe it’s a coincidence that this narrative is precisely the one a team of social scientists would devise if tasked to come up with something that would maintain indefinite support for a never-ending war. But it would be foolish not to at least wonder. War is awful for almost everyone. But for a few narrow factions, there’s a lot of money to be made and power to be accrued. You could even go out on a limb and argue that war is a racket. If you were really clever, you’d probably want a backup enemy–a Plan B in case the current enemy du jour were ever somehow actually defeated. In which regard, maybe it’s a coincidence that we are now being told we are now in a new cold war with a resurgent Russia and that Vladimir Putin is behind everything bad in the world. But once again, it would be foolish not to at least wonder. In 2008, Barack Obama was the peace candidate, yet the war continues and the use of drones has increased. The choices in 2016 appear even worse. Hillary Clinton is probably the most hawkish war monger to run for president in recent memory. Besides pushing for the Iraq war based upon false claims of ties between Saddam and al Qaeda, she is the architect of our disastrous policy in Libya, and wanted to repeat the same mistakes in Syria based on absurd arguments. She has also been pushing to extend the conflict to Russia, with a new Cold War, if not an outright hot war. Her opponent, Donald Trump, has at times spoken out against Clinton’s interventionism, but has been far too incoherent on foreign policy (and everything else) to be seen as a serious alternative. While Clinton appears most likely to win, with Clinton’s favorability at records lows, Trump has been cutting into Clinton’s lead, including pulling into a tie in the latest Reuter’s poll. Third party candidates Jill Stein and Gary Johnson might provide a real difference but are marginalized by our system, not even being allowed in the presidential debates, despite widespread dislike for the major party candidates. Just today, Bernie Sanders did say that the threshold for minor parties participating in the debates should be lowered. It is unlikely we will see any real change, or an end to our perpetual war, unless other voices are heard. After failing to challenge Hillary Clinton in the first Democratic Debate, both Bernie Sanders and Martin O’Malley put Clinton on the defensive in the second (transcript here). The added focus placed on the terrorist attacks might have played to the candidate who tries to sound the toughest on terrorism, but instead highlighted how (as I discussed prior to the debate) it was Clinton’s neoconservative foreign policy views, which are essentially the same as George Bush’s, which led to the destabilization of the region and creation of ISIS. While Clinton admits that her vote for the Iraq war was a mistake, this does not get her off the hook for being one of the strongest advocates of going to war. She also demonstrated that she did not learn from her mistake in advocating greater military involvement in Syria and Libya. Sanders did make a mistake in his opening statement, insisting on sticking with his planned concentration on economic matters rather than shifting to say more about the Paris terrorist attacks as Clinton and O’Malley did. From there, both Sanders and O’Malley criticized Clinton’s policies, but sometimes appeared to pull back, failing to give the knock out punch before a partisan crowd invited by Clinton ally Debbie Wasserman Schultz. Absolutely. In fact, climate change is directly related to the growth of terrorism. And if we do not get our act together and listen to what the scientists say you’re gonna see countries all over the world– this is what the C.I.A. says, they’re gonna be struggling over limited amounts of water, limited amounts of land to grow their crops. And you’re gonna see all kinds of international conflict. Well, in fact, I would argue that the disastrous invasion of Iraq, something that I strongly opposed, has unraveled the region completely. And led to the rise of Al Qaeda– and to– ISIS. Now, in fact, what we have got to do– and I think there is widespread agreement here– ’cause the United States cannot do it alone. What we need to do is lead an international coalition which includes– very significantly– (UNINTEL) nations in that region are gonna have to fight and defend their way of life. In response to follow up questions, which made it clear that Sanders had opposed the invasion of Iraq and Clinton had been in favor of it, Sanders also said, “I don’t think any sensible person would disagree that the invasion of Iraq led to the massive level of instability we are seeing right now. I think that was one of the worst foreign policy plunders in the modern history of United States.” He also discussed other attempts at regime change, concluding, “And that I am not a great fan of regime changes.” Meanwhile Hillary Clinton didn’t help her cause by quoting George W. Bush along with justifying her polices with neocon talking points. …for the first time in this election season, she’s being challenged by Democrats on foreign policy. That’s a very different dynamic than the Benghazi hearing, where the Republican focus on esoteric conspiracy theories made her look good. Against Sanders and O’Malley, she’s having to to defend something larger: her foreign policy vision, which led her to support the Iraq War and later made her a strong advocate for intervention in Libya and Syria. Sanders made a palpable hit by noting the problem with regime change as a policy goal. There are strong echoes here of Obama’s successful challenge of Hillary Clinton in 2008, where sharp differences in foreign policy visions defined the characters. 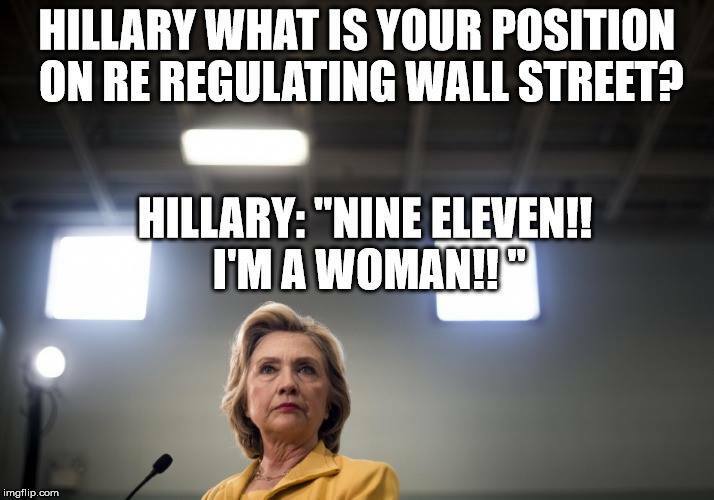 Clinton was widely criticized on Facebook and Twitter for these comments, with many women being offended over Clinton’s use of the gender card, and many Democrats objecting to her use of 9/11. Some of the Twitter responses on her use of the 9/11 card were listed here. Clinton is not likely to live down this moment, with a Clinton response when in trouble now likely to be defined as a noun, a verb, a gender reference, and 9/11. Sanders also had one of the better lines of the evening when he pointed out how we have had much higher marginal tax rates in the past. He said, “I’m not that much of a socialist compared to Eisenhower.” In reality we are not seeing more affluent Democrats avoiding Sanders out of fear of higher tax rates with a recent poll showing Sanders doing the best among Democrats earning over $100,000 per year. Secretary Clinton just a quick follow up, you say that– Senator Sanders took a vote that– on immunity that you don’t like. So if he can be tattooed by a single vote and that ruins all future– opinions by him on this issue, why then is he right when he says you’re wrong vote on Iraq tattoos you for offering your judgment? I– I said I made a mistake on Iraq. And I would love to see Senator Sanders join with some of my colleagues– in the senate that I– see in the audience, let’s reverse the immunity. Let’s let’s go to the gun makers and tell– on notice that they’re not gonna get away with it. But Secretary Clinton, you’ve been on three sides of this. When you ran in 2000 you said that we needed federal robust regulations. Then in 2008 you were portraying yourself as Annie Oakley and saying that we don’t need those regulation on the federal level. And now you’re coming back around here. So John, there’s a big difference between leading by polls and leading with principle. Clinton’s flip-flopping on gun control can be seen in an excerpt from a debate back in 2008 which I quoted extensively here. Sanders and O’Malley did fail to contradict other statements where Clinton dodged and distorted the truth. They let her get away with using her Benghazi testimony as evidence she can withstand further damage from the FBI inquiry into her personal email server. However Benghazi and the alleged mishandling of classified information under investigation by the FBI are two different matters. Her violations of new transparency requirements instituted under Obama in 2009 is yet another issue independent of Benghazi, and something which Sanders and O’Malley should hold Clinton accountable for. Honestly, I don’t want to pay for Donald Trump’s kids to go to school either, but I also doubt any of them would go to school at a public university anyway, so we won’t have to worry about that…So let’s not worry about Donald Trump’s kids and just focus on the majority of kids and parents out there who are going way too far into debt to get educated. There must be a better way. 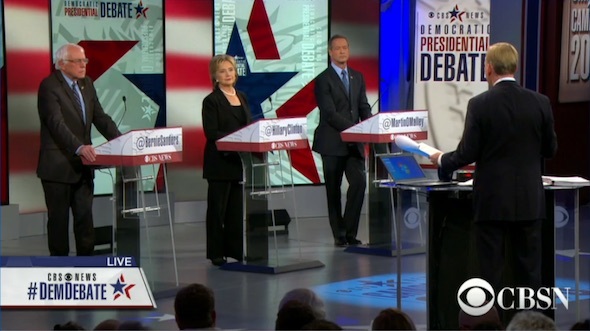 Sanders and O’Malley further criticized Clinton in their closing comments. Sanders once again called for “a political revolution” and O’Malley echoed the same idea in saying, “will not solve our nation’s problems by resorting to the divisive ideologies of our past or by returning to polarizing figures from our past.” Earlier O’Malley accused Clinton of supporting crony capitalism and I wonder when he will run an ad quoting Clinton as saying “I come from the ’60s, a long time ago.” We are also likely to see this line repeated (if she wins the nomination) should a younger Republican, such as Marco Rubio, be her opponent. O’Malley did quit well during the debate but Sanders once again dominated the on line buzz on Facebook and Twitter, along with winning the non-scientific online polls. The bigger question is whether showing the stark contrasts between his views and Clinton’s will remind Democratic voters that the same reasons Obama challenged Clinton in 2008 still hold. Mark Halparin pointed out in discussing Sanders, “If he improves this much again by the next debate, Clinton could have a real problem.” Unfortunately far too few people watched a debate which Debbie Wasserman Schultz scheduled on a Saturday night to minimize viewership. The scheduling of the next debate is even worse (unless the goal is to protect Hillary Clinton from criticism), occurring on the Saturday night before Christmas. Middle-class Americans associate Wall Street with the 2008 meltdown of the economy that cost so many their homes and savings. In the debate Mrs. Clinton repeatedly referred to her plan for reining in banks, but offered precious few specifics. This is what happens when Hillary Clinton the candidate gets complacent. The debate moderator, Mr. Dickerson, had even tipped her off before a commercial break that the next topic was Wall Street. Her effort to tug on Americans’ heartstrings instead of explaining her Wall Street ties — on a day that the scars of 9/11 were exposed anew — was at best botched rhetoric. At worst it was the type of cynical move that Mrs. Clinton would have condemned in Republicans. The documents released by Edward Snowden have already demonstrated that the government has lied to the American people, and to our representatives in Congress, regarding violations of the law and the Constitution in conducting surveillance of American citizens following 9/11. Just as the attack was used by the Bush administration to launch the war in Iraq based upon lies, the attack was also used to greatly expand government surveillance in an atmosphere where there was too little scrutiny of government actions. There have been a lot of side issues raised to try to distract from these real issues. The latest such side issue raised by the NSA actually casts even more doubt on their credibility. If the White House is interested in the whole truth, rather than the NSA’s clearly tailored and incomplete leak today for a political advantage, it will require the NSA to ask my former colleagues, management, and the senior leadership team about whether I, at any time, raised concerns about the NSA’s improper and at times unconstitutional surveillance activities. It will not take long to receive an answer. Ultimately, whether my disclosures were justified does not depend on whether I raised these concerns previously. That’s because the system is designed to ensure that even the most valid concerns are suppressed and ignored, not acted upon. The fact that two powerful Democratic Senators – Ron Wyden and Mark Udall – knew of mass surveillance that they believed was abusive and felt constrained to do anything about it underscores how futile such internal action is — and will remain — until these processes are reformed. Still, the fact is that I did raise such concerns both verbally and in writing, and on multiple, continuing occasions – as I have always said, and as NSA has always denied. Just as when the NSA claimed it followed German laws in Germany just weeks before it was revealed that they did not, or when NSA said they did not engage in economic espionage a few short months before it was revealed they actually did so on a regular and recurring basis, or even when they claimed they had “no domestic spying program” before we learned they collected the phone records of every American they could, so too are today’s claims that “this is only evidence we have of him reporting concerns” false. Considering all the evidence that has been released of dishonesty on the part of the NSA and its defenders, I find Snowden’s statements that he had raised concerns about NSA activities to sound far more credible than the current NSA claim that this suddenly discovered email constitutes his sole complaint. What do the Republicans do when the Affordable Care Act is exceeding expectations, their latest lies have been exposed, and there are no real scandals for them to attack with? Benghazi. Sure it has been investigated over and over again with nothing coming up, but that doesn’t matter. Politics, especially in a year with a midterm election, is all about firing up the base to get out to vote, and we know the Republican base doesn’t care about facts. They have a new email which adds nothing new to the story, but that is apparently enough for John Boehner to call for yet another investigation. Or as Paul Waldman put it, The GOP hunt for a Watergate-scale scandal continues (even though there is nothing there). David Weigel reported on the “shocking” news that the email showed that the White House agreed with the CIA talking points. From there Weigel presented a time line which you might want to go through to help put all this nonsense into perspective. If the crime is that the Obama administration, two months before a presidential election, was concerned with putting the best face on the attack, Team Obama is probably guilty. But the emails do not suggest that the administration lied to the American public, let alone orchestrated a vast cover-up of some massive intelligence or policy failure. Maybe they need a new committee to investigate as Darrel Issa’s witch hunt is falling apart. If Congress really wants to investigate preventable deaths of Americans, they can look at how George Bush ignored intelligence briefings warning about the 9/11 attack, and then responded by sending more Americans to their death in the Iraq war based upon lies. Rather than dwelling further on Susan Rice, they might look at how Condoleezza Rice lied when she denied receiving the anti-terrorist strategy from the Clinton administration. They could look at previous embassy attacks under Republican presidents, including the over 320 Americans who died in embassy attacks under Ronald Reagan or question why Republicans cut funding for embassy security. Jonathan Chait looked at demographic and political trends to consider whether the trend towards the Democratic Party is likely to continue. Much of what he wrote is a recap of the conventional wisdom these days, with some disagreeing. He considered multiple factors including the tendency of the young and minorities to vote Democratic. To some degree this could be offset by an increased trend for white voters to vote Republican out of a backlash against the increase in minorities. While Democrats are expected to dominate in presidential elections, there certainly can be exceptions if there is a major occurrence favoring Republicans as the party out of power. Plus Republicans should continue to maintain a sizable portion of Congress due to the higher turnout among Republicans in off year elections as well as structural advantages in each House. Republicans have an advantage in the House of Representatives due to gerrymandering and the greater concentration of Democrats in urban areas, giving Democrats victories by larger margins in a smaller number of states. Republicans have an advantage in the Senate due to smaller Republican states having the same number of Senators as the larger Democratic states. Republicans therefore have a reasonable chance of controlling each House, or come close as is now the case in the Senate, despite a larger number of people voting for Democrats to represent them. My belief, of which I obviously can’t be certain, is that conservatism as we know it is doomed. I believe this because the virulent opposition to the welfare state we see here is almost completely unique among major conservative parties across the world. In no other advanced country do leading figures of governing parties propose the denial of medical care to their citizens or take their ideological inspiration from crackpots like Ayn Rand. America’s unique brand of ideological anti-statism is historically inseparable (as I recently argued) from the legacy of slavery. Whatever form America’s polyglot majority ultimately takes, it is hard to see the basis for its attraction to an ideology sociologically rooted in white supremacy. Jonathan Bernstein sees the United States as remaining more of a 50:50 nation as in 2000, also citing George Bush’s victory over John Kerry in 2004. However the Democratic advantage in the electoral college has increased tremendously since 2000 when George W. Bush was able to come in a close enough second to take the presidency due to irregularities in Florida and a friendly Supreme Court. This victory in 2000, along with the 9/11 attack, gave Bush, as an incumbent during time of war, an edge which future Republican candidates are unlikely to enjoy. The current political divisions won’t last in their current form forever. At sometime there is likely to be a major event which shakes up the current divisions. Chait noted that this might have been the 9/11 attack if the Republicans hadn’t squandered their political advantages by their disastrous invasion of Iraq. I would add to that being on the wrong side of far too many other issues prevented the Republicans from becoming a long-term majority party. Most likely at some point in the future the far right will lose their grasp on the Republican Party as those who actually want to be able to win an election eventually regain control. Perhaps this will come as a newer generation rejects the most extreme ideas of the current conservative movement. If the Republicans don’t change, eventually a third party might challenge them, as difficult as it is for third parties to compete in our current political system. We might also see the Republicans persisting in their current form as a southern regional party as others battle for political control in the rest of the country.